Deep in the lower Brightshard, there lay an abandoned mine whose entrance was hidden in the shadow of Mount Parmek. Inside the maelstrom of bizarre corridors and tunnels, a young lady screamed her frustration to the darkness. “No no no no no,” she explained to the empty cavern. Her non-torch hand frantically searched through the remnants of smashed Soul Jars mixed with the occasional puddle of ghoul guts and…she did not even want to know what else. Her magic was spent during the recent battle. 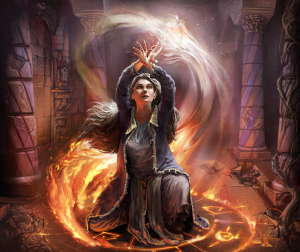 Broelyn of the Loreweaver clan, as well as a dozen more champions from in and around Thandar, had been summoned to do battle with a Lich. The Lich was (as usual) handily defeated, and the rest of her battle companions had already left for their various homes. The only sound that echoed through the cavernous mine was Broelyn’s frenetic search, and the occasional Elvish curse word. Elves only had two curse words, and Broelyn was using the least objectionable of the two, but this still indicated that she was very upset. 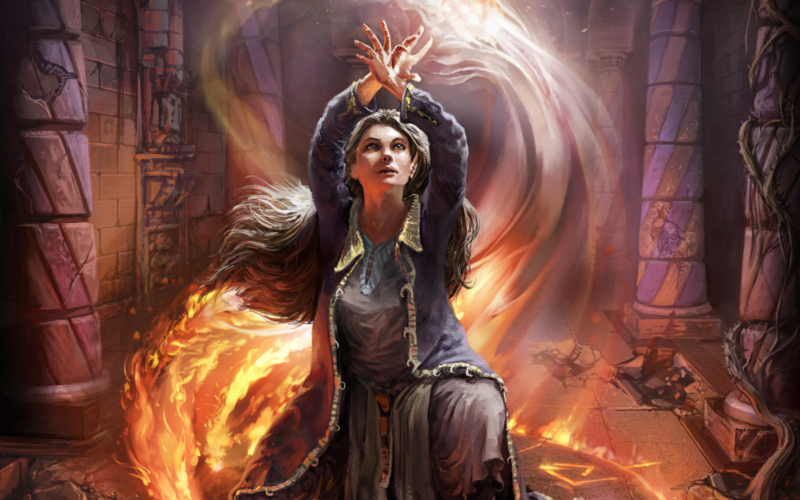 Eyes wide, Broelyn wheeled at the sound of the voice, and saw a human mage approaching with hands ablaze in cold fire. Broelyn tensed up as Rayla stepped closer. 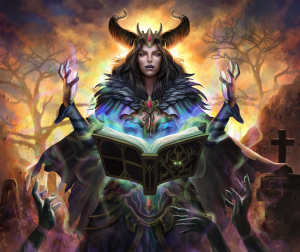 The mage was dressed in the black uniform of the Cult of Necros, though she had improved on the already ghastly design so that her clothing appeared even more twisted, dark, and unreasonable. “Hello Broelyn,” said Rayla as though they were old friends. Broelyn did not know how to answer. What was a death cultist doing here? And why was she being nice? “What are you doing here?” asked Broelyn, choosing the direct approach. “I came to help. It seems like you’re looking for something,” said Rayla. “I am also bored.” The flames on her hands brightened, throwing light all around the room. Broelyn extinguished her torch. Rayla stepped closer. The human mage could see that the Elf was terrified. Probably drained of magic, feeling terribly alone, and certain of her own demise. She also remembered Broelyn as being rather kind, and Rayla was not used to kind people being anywhere near her. At the very least, the people near her were seldom kind. Today she needed the help of a kind person. Broelyn strangely felt like she could trust this death cultist.. There was something…reassuring…about her. Rayla nodded. Her hands flared once again, and the distinct sound of a musical note filled the air of the cavern. Broelyn turned, and followed the source of the sound. “I found it!” she said. Broelyn held up a simple Elvish bracelet. It was silver, and (thanks to Rayla’s spell) glowing and humming as though finishing a song. Rayla ceased her spell as Broelyn returned the bracelet to her wrist. “I still don’t know that I trust you,” said Broelyn. Several weeks later, the edge of the Kamekrian Mountains ran red with blood. The bodies of several creatures lay scattered around a battlefield. A battlefield that had very recently rang with the clashing steel of battle. There was also a dragon here, but she was dead and her treasure was gone. It was here that a young Elf of the Loreweaver clan woke up, having been knocked unconscious by a particularly nasty tail swipe. Broelyn groaned, and staggered to her feet. “Oh thank Necros you’re awake,” said a familiar voice. Broelyn shook the cobwebs from her head and turned towards the sound. She saw a giant Ogre clearly dead. Beneath the Ogre, a human mage, very much alive and angry. Broelyn looked over the situation. The ogre must have weighed at least a ton. Rayla was wedged into a depression in the rocks with the dead Ogre body on top. She was stuck, but relatively safe. “I’m not sure how I can move it,” said Broelyn. “We can combine our magicks,” said Rayla. “I doubt you would understand,” said Rayla. Rayla said nothing, but her annoyance was evident. She had just about enough of the conversation, and she was sure that Broelyn had sufficient time with which to recover. The mage grabbed Broelyn’s hand in her own, and a surge of magic radiated from the joined limbs. Slowly, the Ogre moaned, and he rolled over with some effort, freeing Rayla. The mage climbed from the depression before the 2000-pound creature breathed his last breath for a second time. Broelyn nodded, and vanished without another word. It was a cold night in Thandar when the Ruinos Cult attacked. Nobody expected them, least of all those in the Necros family. But fortune was with the citizens of Thandar, as adventurers had gathered from around the realms and called champions to their side to fight for the city. They had cornered a priestess and her minions in a mist-covered courtyard. Broelyn was there, having entered the city to trade with the humans (and of course, stopping off for a pint or two.) Now, along with a random collection of interesting characters, Broelyn was facing down dozens of razor-toothed imps, and who knows what else? Sensing a presence other than the obvious, Broelyn looked around. She saw the familiar glow of Necros magic from the hands of a young human mage. Rayla, perhaps sensing something of her own, met Broelyn’s gaze. Something like a smile passed between them. They weren’t friends, but they weren’t enemies either. The moment was spoiled by the screams of attacking cultists, whose attack was met with lightning and death. Broelyn never saw Rayla after this battle. She wondered if she ever would again. But no matter what, the Loreweaver wished her battle-sister would have a long story with a truly grand ending.